Everyone who has a garage will probably agree that they fill up quicker than you can imagine. This is especially true with a family. You have your car(s), outdoor power equipment, workbench, all your tools, and toys for the kids. Finding a good spot to store your bicycles is often an afterthought. If everybody in the family owns a bike, the problem and frustration of unorganization and tripping over bikes only multiplies. 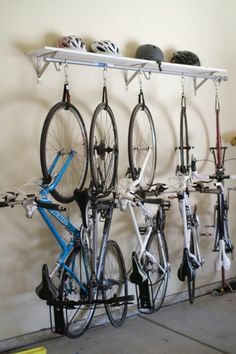 The best solution is some type of garage bike rack to simply hang them up; either on the wall or on the ceiling. With kids, storing on the floor is usually the way to go. This is the preferred method if there are kids in the family as they can be low enough to the ground for them to be able to get their own bike while still keeping the floor clear. All sorts of wall-mounted hooks are sold. Most allow the bike to hang horizontally while others use a vertical orientation. A few wall-mounted bike storage systems even have hooks or baskets to store helmets and other bike accessories. A big advantage with hanging on a wall is that if your bikes get a lot of use, they are easy to access at all times. A good creative option is to hang bikes directly underneath a bike helmet shelf. To save even more space, especially with garages with higher ceilings, hanging your bikes from the ceiling is optimal. 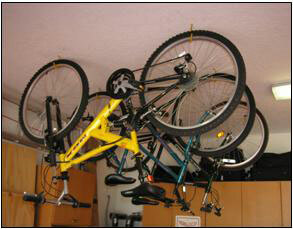 Most often, the best way to hang bikes in the garage is with a ceiling-mounted bicycle hanging system. It can cost only a few dollars if you purchase just basic hooks or tool hangers that you screw into studs. Or for a cleaner, more professional look, you can purchase elaborate systems which can cost hundreds of dollars. The biggest drawback with ceiling storage is that bikes are harder to access if you ride frequently. If that’s the case, the wall storage method is preferred. But, one way to overcome that is with a pulley system, such as the one found in our top bike rack pick. This one mainly applies to when you have little ones around the house. Obviously, your 6 year old isn’t going to be taking their bicycle off a rack on the wall or using a pulley system on the ceiling. Instead of just having their bikes thrown on the ground or even when using their kickstand, a proper bike rack will keep things better organized and in their rightful place. Floor standing bike racks are available for purchase or you can simply build your own DIY bike rack using free instructions found online. Custom racks made out of PVC are super easy to make and light enough that you can take them with you. Here’s an example of simple 3-bike rack that even fits in the back of a pickup truck. You can easily customize the design to store different sizes of bikes, more bikes, space them out further, or paint it if you choose. While a floor-standing bicycle rack won’t clear up valuable floor space like the options above, it’s much better than nothing. Your kids will love it since they’ll think of it as their own bicycle garage. If any of these options don’t sound appealing or you simply don’t have the room, the next best thing to do is store bicycles in an outdoor shed. It can be a regular garden shed with area designated for bikes or even a single purpose bike shed which is actually pretty simple to build. Just be sure to have some type of good locking capability to make sure your bikes stay safe.